In this article, we'll talk about how to travel around Madrid on the various Metro lines. 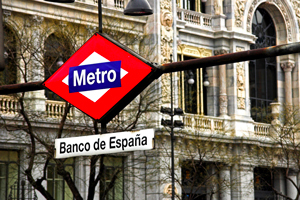 In order to get around in Madrid, the Metro is undoubtedly one of the best options available. The network offers excellent connections with every area of the city and, of course, with the main tourist destinations, which makes it easier to get your bearings in the capital. In addition to this, the frequency of the trains makes this one of the quickest and most efficient ways of travelling around the city of Madrid. The network consists of twelve Metro lines, three lines on a Light Rail System and a branch line that connects the Plaza de Opera with the Príncipe Pío station. Each of the 12 metro lines, in addition to having a number, is differentiated from the others by colour. it is worth keeping in mind the Lines that are likely to be of most interest. For example, Line 8 connects the city with the Airport from the station of Nuevos Ministerios and only takes 20 minutes to reach Terminal 4 (T4) and less than 15 minutes to reach the other terminals. The Lines that cross the city centre, and therefore, cover the main tourist destinations, are Lines 1, 2, and 3. Line 6 is a circular line that surrounds the main city centre. Line 12 is also circular but in this instance, it covers the districts to the south of Madrid: Alcorcón, Móstoles, Fuenlabrada, Getafe and Leganés. Another Line that connects with the commuter towns on the outskirts of the capital are Line 9 which travels to Arganda del Rey and Lines 2 and 3 on the Light Metro service which connect with Aravaca, Pozuelo de Alarcón and Boadilla del Monte. Line 1: Pinar de Chamartín - Valdecarros. Line 2: Las Rosas - Cuatro Caminos. Line 3: Villaverde Alto - Moncloa. Line 4: Argüelles - Pinar de Chamartín. Line 5: Alameda de Osuna - Casa de Campo. Line 7: Hospital de Henares - Pitis. Line 8: Nuevos Ministerios - Airport T4. Line 9: Paco de Lucía - Arganda del Rey. Line 10: Hospital Infanta Sofía - Puerta del Sur. Branch Line (R): Ópera - Príncipe Pío. The public transport system in Madrid operates with a Multi Card. This is a ticket that can be topped up, is not user specific and, if bought as a tourist pass, is supplied for free. If you don't obtain it in this manner, the cost is €2.50. If purchased as a Tourist Pass, there are different rates for 1,2,3,4,5,6 or 7 days which start to count from the first time the pass is used. Once the tourist rate has ended, you can recharge the card with either single journeys or up to 10 trips. With this pass, you can use the Metro, the buses that are operated by EMT and the commuter trains. You can buy these in any of the stations for the Metro or the Light Rail system at the ticket machines showing a red sticker and a sign advising that they are "available here." There are two zones that are covered by the tariff system. Zone A which more or less covers the main part of the city of Madrid and Zone T which covers the suburbs that are closest to the capital. This is one of the reasons why the rates for the Tourist Pass operate on the basis of the number of days and the zones covered. Once the Tourist Pass has been fully utilised, the price of a single ticket is €1.50 or €2.00 depending on which stations you are aiming for and a ticket for 10 journeys costs €12.20.